Maybe you have a special event coming up, but in any case there's usually no better time than now to do something about discoloured teeth. Tooth whitening is very simple, safe, quick and effective. In one visit to Lewisham Dental Practice you can come out with teeth several shades whiter than when you walked in, or you can opt to do it yourself using our take-home kit with trays customised to fit your teeth. We use the incredibly popular Zoom brand of tooth whitening because it's safe and well proven. Professional strength Zoom whitening is only available at your dentist. There are two effective treatment options - Power whitening in the surgery or self-administered at home. With all whitening products, individual results will vary, depending on the natural tooth colour and the nature of the staining. Power whitening takes up to two hours, after which your teeth will be several shades lighter - job done! You just relax in a comfortable dental chair listening to music while the hydrogen peroxide goes to work, aided by a special light. You will also be given two top-up whitening trays to take home. At-home tooth whitening works more slowly but after several days is just as effective as power whitening. In this case there is the option of trays that can be worn for a short time each day or overnight. Top-up trays can also be purchased from us as needed. If you think now is the time to do something about your discoloured teeth, or if you think tooth whitening will make a difference to your enjoyment of an upcoming event, give us a call or pop in and talk to us. We will be very happy to advise you on what is the best treatment for you. 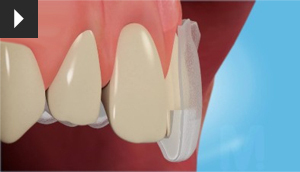 Alternatively, we can provide you with custom made mouth trays to whiten your teeth at home. A whitening gel is placed in the tray which you then wear whist asleep or for short periods during the day.